Whenever you see a news story that contains imbalanced and inaccurate information about health care, you’d be justified in wondering whether the content originated with a poor-quality PR news release. 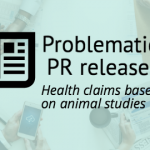 We’ve been demonstrating how these promotional documents can mislead readers about animal studies, phase 1 research, and minimally invasive surgery — to name just a few of the themes that we’ve hit upon in our problematic PR series. But there’s another theme we haven’t called attention to and which deserves increased scrutiny from journalists and the public: Many of these problematic messages are broadcast to the world via Eurekalert!, the PR newswire service run by the American Association for the Advancement of Science (AAAS). AAAS is the world’s largest multidisciplinary scientific society. It organizes conferences, publishes peer-reviewed journals, and generally advocates for science literacy and the responsible use of science in all areas of public life. But in a troubling contradiction, it’s also home to a global clearinghouse for unvetted PR messages from universities, medical centers, journals, drug companies and other organizations who pay the EurekAlert! service to broadcast their new releases. Claims that extra virgin olive oil can prevent Alzheimer’s disease based on a study conducted in mice. Claims that a magnetized wire could be used to detect cancer in people based on a study conducted in pigs. Claims that text messages could help pregnant women stop smoking based on a study that found no difference in smoking rates between the treatment and control groups. 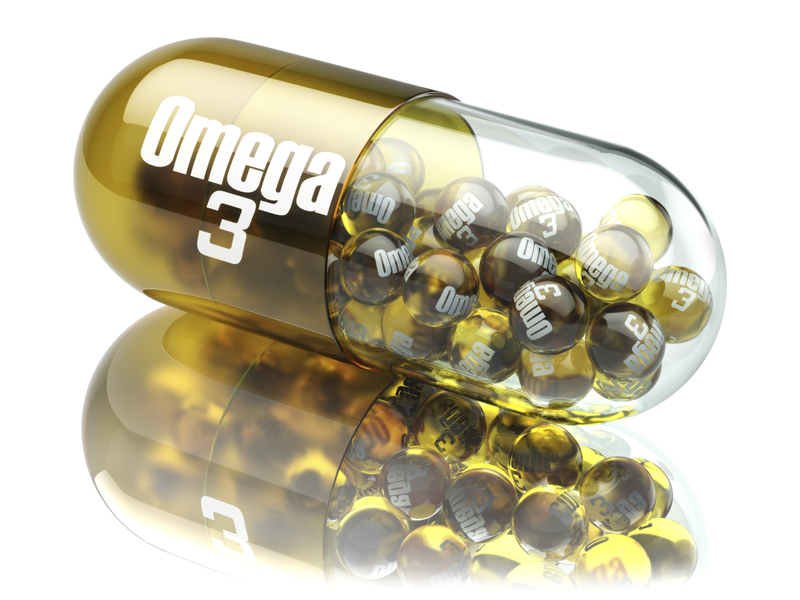 Claims that eating more fish could prevent Parkinson’s disease based on an in vitro lab study of fish proteins. Again, these are just a handful of the most shoddy recent examples. We also encounter a daily stream of more subtle and insidious messages that arguably do just as much damage — for example by overstating the conclusions that can be drawn from observational research. Why is AAAS undercutting its own mission by also spreading inaccurate and incomplete information that, in many cases, grossly misrepresents science to the public? I posed this question to a number of journalists, public affairs officials, and academics. They all responded that EurekAlert! has an obligation to do better. 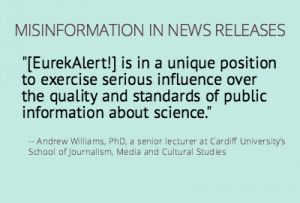 “I think it’s entirely fair and reasonable to ask EurekAlert!, and other similar services, to apply more active quality control mechanisms when publishing or re-publishing promotional material about scientific research,” said Andrew Williams, PhD, a senior lecturer at Cardiff University’s School of Journalism, Media and Cultural Studies. Williams was one of several co-authors on a seminal BMJ study documenting how exaggeration in health-related news releases is associated with exaggeration in related news stories in the popular press. “As a platform with unprecedented reach, and a go-to resource for journalists and public relations officers all over the world, [EurekAlert!] is in a unique position to exercise serious influence over the quality and standards of public information about science,” he said. 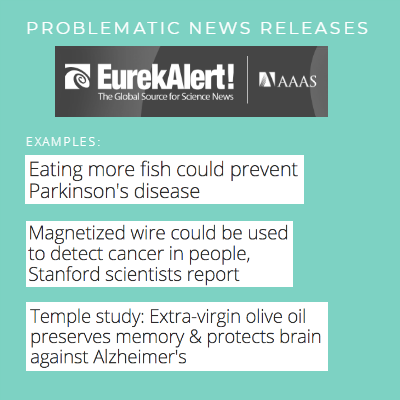 AAAS disclaims responsibility for the accuracy of material posted to EurekAlert! by contributing institutions and for the use of any information obtained through EurekAlert!. Support from sponsors does not influence content or policy. In response to mounting evidence that the social networking site has been used to spread political disinformation to sway elections, Facebook has expanded its efforts to fact-check news stories and root out the fake accounts that promote them. Williams seconded the suggestion that, like Facebook, EurekAlert! has a responsibility to safeguard its users from misleading content. What would an expanded effort to improve the quality of PR news releases look like? A much greater impact would be possible if EurekAlert! acted more like a traditional publisher, Williams added, actively employing editorial resources and standards to police its content. “That would be a real game-changer,” he said. Whose job is it to provide editorial oversight? Earle Holland, who was the senior science and medical communications officer at Ohio State University for 35 years before retiring, believes it would be a relatively simple matter for EurekAlert! to adopt a rudimentary labeling system like the one Shipman and Williams propose. “All it would take was for their programmers to add a half-dozen new fields to their template that submitters needed to fill out and that would incorporate the kinds of answers you suggest,” he said. But as someone who was involved with EurekAlert! for more than a dozen years as a national advisory board member, Holland doesn’t expect these suggestions to be embraced by the organization. He described the EurekAlert! team as “largely an IT shop” and said they “don’t see it as their job” to provide editorial oversight. “My skepticism is based on the numerous times we on the advisory committee suggested improvements that required modifying their model and were rebuffed, being told that their clients hadn’t requested it and they were responsive to who paid them,” he said. When told that experts in health-related communication were calling for more robust quality controls at EurekAlert!’, the Director of Editorial Content Strategy, Brian Lin, suggested that the newswire is already providing adequate oversight of its content and has little need to do more. “Even though the responsibility to ensure the accuracy of a news release ultimately lies with the issuing institution, EurekAlert! as a distribution platform has always taken an active role in achieving a basic level of integrity in the content we host, precisely because we are part of a scientific society and because we value the trust that reporters, public information officers (PIO), and members of the public place on us,” he said. Lin pointed to user and content guidelines that he said are “some of the strictest among similar services” and noted that each of the release submissions they receive is reviewed by at least one staff member against those guidelines. “For research-related news releases, for example, we require that the associated paper is published in a peer-reviewed journal, and we encourage PIOs to submit additional information, such as links to the paper, DOI, and third party comments that would support independent reporting.” In addition, he said that EurekAlert! is “looking into the possibility” of incorporating elements of the UK news release labeling system in future system updates, and that it “absolutely” supports basic quality standards for news releases such as those advocated by HealthNewsReview.org. But Lin’s claims ring hollow to HealthNewsReview.org publisher Gary Schwitzer, who noted that EurekAlert!’s standards haven’t been adequate to stop the blatant misinformation that we’ve encountered on an almost daily basis on our blog and in our news release reviews. “If their requirements are, indeed, ‘some of the strictest among similar services,’ then the entire field is in bad shape – which is, of course, what we’ve documented with our nearly 600 release reviews,” Schwitzer said. EurekAlert! isn’t the only PR news service engaging in the distribution of misinformation. Private, for-profit newswire services such as PR Newswire and Newswise enage in similar, possibly worse practices that confuse and mislead the public. But EurekAlert! is the only such service that’s part of a non-profit scientific society dedicated to educating the public about science. As such it seems like a good place to start demanding higher standards. 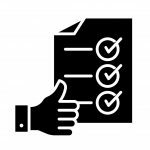 We’ve laid out criteria upon which these standards could be based and showed how they could be applied in nearly 600 reviews of news releases. Now EurekAlert! has an obligation to take the next step and help put a brake on the health news spin cycle. News release labeling system launches in the UK: Will it help cleanse the polluted stream of media messaging? At the time we published this piece above, we were not aware of another important and related article, “EurekAlert! Has spoiled science news. Here’s how we can fix it.” It’s worth reading. The scientific establishment is addicted to tax dollars and as a consequence they hype just about anything you can imagine. This is why most published so-called research is false, why data is heavily manipulated to produce ‘significance,’ why many studies of extremely expensive remedies barely improve survival and probably hurt quality of life to a great degree, yet they are touted as extremely relevant. Somehow there needs to be a massive reset on public funding for what amounts to snake oil. I realize this article is focused on EurekaAlert, and whether there should be more oversight–but much of the problem does lie with the journalists/news organizations that publish the story. It is very obvious that many “articles” are simply reprinted press releases. No one ever pulls the actual study and reads it, or talks to the author, or gets an outside comment. I realize there are many dynamics, and journalists often don’t have the time or the go-ahead to put effort into a story. But a press release is generally going to give a positive spin–that’s why the news has been released–and the accuracy can vary considerably. And if no one wants to take the time or effort to actually write the article, well, this is why we get a lot of poor reporting. There is plenty of blame to go around. And if you peruse our website where we’ve systematically reviewed some 2600 news stories and pointed out in great detail how journalists could and should do better, you’ll see that we have not spared journalists and news organizations from criticism. With that being said, the sorry state of some journalism is no excuse for inaccurate and misleading PR communications. If it’s impossible to make a study sound interesting without overstating its importance, then perhaps it’s not news that’s worth releasing to a general audience.